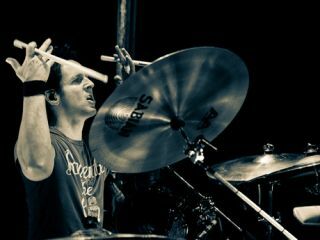 "My drummer's got to be flashy," said Alice Cooper of the man who got the gig, Glen Sobel (above). It's a late summer afternoon, and Glen Sobel is kicking back at his home in Los Angeles. Only problem is, he wasn't planning on being here. Until a week ago, the star sticksman was pounding the skins with Alice Cooper, the opening act on Iron Maiden's current US tour. Just days into the month-long run, however, a neck injury forced Sobel to take a temporarily leave of absence from the band he joined in 2011 to seek medical treatment and heal. Playing with the master of shock rock is the latest addition to Sobel's impressive CV. In recent years, the versatile player has become an in-demand fixture on the competitive LA session scene, recording with acts as disparate as Nikki Sixx's SIXX A.M. and American Idol finalist Elliot Yamin. Sobel spoke with MusicRadar about his medical condition, what it takes to land gigs, his spiffy new Mapex kit and which drummers he'd recommend to young players. Explain to us the nature of your neck injury. "Well, it's a C6, C7 condition, a bulged disc situation that I've dealt with for a few years. In the cervical spine, there's numbers assigned to each part of your vertebrae. The cervical part is up in your neck. Basically, you have the cushioning between your discs, and they can get bulged or torn. It can happen with just life in general or with activities like drumming, which is how it happened to me over the years. It happens to lots of drummers. "There's treatments for it, such as epidurals, which are like cortisone injections that are given directly into the neck. I had those nine years ago, and I had one when I was on the road in North Carolina. This was after I had an MRI, where they look at your soft tissue. "I'll probably have another epidural on Monday. They usually do them in groups of three. The epidurals deaden the pain and they can bring down inflammation." So the doctors are pretty sure you won't need surgery? "Well, you can never say never, but I don't think that's going to be the case. The first epidural really helped, but then I did a couple of shows in a row, and the situation got aggravated. So I think after a couple of more epidurals and some rest I should be OK. Everything is basically up to me - the lack of pain and how I'm feeling. I should be ready to go back out in three weeks. I'm feeling a whole lot better already." How many shows into the Alice tour did it take for you to notice something was wrong? "There were things from the very beginning. We rehearsed so much that it pushed me over the edge. There were better days and there were not-so-better days, and then for the last five or six shows I was playing on Vicodin. At that point, you have to take a break. Like I said, it's happened to a lot of drummers. I've been hearing from lots of guys who have told me it's happened to them." Speaking of flashy, there's Sobel's Mapex MyDentity kit with 'V' shaped Gibraltar hardware. Neck issues notwithstanding, how's it been playing with Alice? "Oh my God, fantastic! We've been out with Iron Maiden, and that's just a perfect combination. The Maiden fans, the Cooper fans - some are into both, some aren't, but it's basically been a win-win. The Maiden and Cooper camps have had a very good relationship for a number of years now. We did shows with them last year, and they were great." Playing before a Maiden crowd, do you tend to perform a little harder than usual? "I don't think so. We were playing it the way we always were. With the Alice gig, so often we're on these festival lineups - like last year, we'd be going on right before Slipknot and following Mastodon - so you do play with a certain heaviness that a lot of people might not expect. Even people like Paul McCartney, it's like the show is on steroids. [laughs] It's all beefed-up, and I think it should be. "This isn't a nostalgia trip. We pay respect to the songs, and I play the drum parts that are key to the tunes, but there's definitely things that we do to heavy it up." You've been around the scene and people know your name, but how did you happen to get the Alice gig? "Like it happens with me and most people, it was through what I call the 'bro hook-up.' You can go on auditions, and you can learn a lot, even when you don't get the gig. For Alice, it wasn't through an audition; I did a recording session in Nashville for Alice - I didn't meet him at the time; it's common that you don't meet the artist even when you're doing a session - and Tommy Henriksen, who's in the Alice band, is somebody I go way back with. He brought me in on this Alice session that he was co-producing, and the guy who was overseeing everything was Bob Ezrin, who's a legendary man, of course. "I did the session, and Bob brought me, Tommy and Steve Hunter into the gig. This is because Bob was asked to be the musical director for the tour. He brought my name up to Alice, and Alice said, 'Well, OK, I've heard Glen on the recording, but I've got to see him. My drummer's got to be flashy.' [laughs] They pulled up a couple of my clips on YouTube, Alice watched them and said, 'All right, that's the guy.' Tommy called me up and said, 'You wanna do the Alice Cooper tour?' and I said, 'Absolutely!' So that was that." [laughs] "Yeah, well, that helps. No, seriously, I do get asked that - 'How do you get gigs? How do you get a job?' Here's what I think: There's a certain skill set that you need to have. There's a lot of technically proficient players out there who can play the most complex stuff you've ever heard, but most gigs don't call for that. Most artists and producers are looking for people who can play rock 'n' roll with the right energy and spirit." "Next, you have to have the right attitude, and that goes for the music and the people you're going to be involved with. You have to fit in personality-wise. And it's gotta be genuine; you have to be congenial. You have to be that kind of guy who's a cool dude. [laughs] It sounds dumb, but it's very important. People don't want to spent time with somebody who's not a nice person. "There's different types of gigs. This gig is one where you have to play and interpret the music the right way. You can't have an agenda of putting your own stamp on the music right away. That goes along with attitude, I suppose. There's other gigs where I've been called to fill in for somebody at the last minute. Reading music is important for something like that, because you have to be able to map things out, chart the songs, make kind of a cheat sheet. If you do that enough, you get a reputation as 'the guy to call.' Sometimes there's very little rehearsal time when you're called in at the last minute, so you have to be able to go in and do the job. If you can make other people's lives easy, they're going to want you around. "Another thing is being able to play to a click track. That's one of the more common things that comes up on gigs nowadays. On the Alice Cooper show we don't run backing tracks, but a lot of gigs do, so there will be things run on MP3 players or Pro Tools, and you'll have extra guitars, percussion, keyboards and even vocals. When you've got all that going on, the drummer has to play along to it. For some people, it comes easily; for others, it doesn't. But you should have that in your skill set, for sure. "Those are the main things. Connections are important, but those come with doing the job and being the right kind of person. People have to be able to vouch for you as a player and a human being." Let's talk about the kit you're playing. It looks incredible. "Yeah, it's the new Mapex kit called MyDentity. You can go on Mapex's website and basically select your shell sizes, the number of pieces in the kit, the finish on the drums and the color of the hardware - meaning the rims and the lug casings and all that. There's a kit builder on the site and you can put your whole dream set together - it's pretty great." You've been with Mapex for a while now. What do you like about them so much? "I've been with Mapex for 13 years now. They're really outdoing themselves, it seems. I started out on the Orion kit, then they had the Saturn kit, and now I'm playing the MyDentity kit. The craftsmanship is great, the hardware is killer, and they have these omni-lock boom stands which allow you to move the cymbals however you need them. They really pay attention to what drummers want and need. Plus, the sound is there - you can bring the tones out of the drums very easily." The Gibraltar hardware on your kit for the Cooper tour is pretty stunning. Brent Barnett from Gibraltar, my drum tech Michael Miller and I got together for a long 13-hour day to put together the new custom rack. We started with the original setup with cymbal stands, and then Brent measured distance to floor, angle, etc. Brent then took out the pipe cutters and cut the 'V' bars to size and fit the cymbal boom arms inside the tops. This actually is a much easier process for Michael to set up the kit for shows. Many people think the opposite, but this way everything is in the same place, and there's no need to tape down cymbal stands due to them traveling when the cymbals are struck. "I definitely had input on the design, but my first priority was playability. Turns out it feels exactly like the same setup I had last year with stands. The idea for the 'V' bars came from Michael and then Brent. This is a slightly different type of bar from the curved Gibraltar rack hardware that you see many other kits." If you were talking to young players just starting out, which drummers would you recommend they listen to? "I remember a friend once told me that if he was ever asked to do a drum clinic, he'd come out and say, 'Good evening, everybody. Listen to Led Zeppelin and James Brown. Goodnight!' [laughs] But that's not too far off. You have to start at ground zero. John Bonham is absolutely in my top five, if not number one. "For number two, I could say 'the drummers who played with James Brown' as if they were one guy, but they weren't just one guy, of course. You had Clyde Stubblefield and Jabo Starks and Melvin Parker and a few others. I tell people to start with James Brown's 20 All-Time Greatest Hits. Play with those songs and try to feel what those drummers are feeling. They're not hitting hard, nor are doing a lot of fills, but to me, that's where a lot of things began. "Beyond that, Neil Peart, sure, but I think he's kind of a given. There's so many people listening to him that I think a highly technical player like him has to be balanced out by somebody like Bonham. Then you've got your fusion guys like Billy Cobham. I always thought he was pretty important because he was a huge groundbreaker in the '70s; he was doing things that had never really been heard before. Other guys in that category are folks like Alphonse Mouzon and Lenny White. If I had to pick one in that realm, I'd say… Cobham. "But then you've got Vinnie Colaiuta, a monster talent technically, but the cool thing about him is, he knows when not to sound like himself. I mean, he's played with Frank Zappa and Allen Holdsworth and all of these insane artists, but he's also played with Faith Hill and Queen Latifah and Megadeth. Through it all, he plays straight, good-feeling time, and that's a real testament to his abilities. "There are guys who base their whole method of playing on Vinnie and Dave Weckl, but then they can't break free from that; they force that agenda on every gig they do. Even Vinnie knows when not to do that." A show's not a show without a proper stick toss. Who would be some left-field choices? You know - players who aren't often cited, but they have something about them that you think is great. "Cozy Powell comes to mind. I've listened to him a lot, and I've had to play his parts because I've played with Graham Bonnet, who sang in Rainbow with Cozy Powell. To some people, he might be an obvious choice. He played with such power and finesse - you know, that '70s big-rock feel. There's a certain feel and sound to '70s drumming that you don't get with '80s drumming. Even listening to old Alice stuff, Neal Smith - there's definitely Keith Moon influences in there, but he had his own thing going on." Where do you stand on Ringo? "Oh, I love Ringo. You know, when you're a teenager and you're just getting into metal and extreme drumming, you might not understand a guy like Ringo. One of my mentors was Gregg Bissonette. I was his student when I was 18 years old. Gregg's always been a big Ringo guy, and I hear it in his playing. He's done drum clinics where he analyzes the Ringo style - and now he even plays in Ringo's band! He really opened my eyes to how creative and musical Ringo is. I was just listening to A Day In The Life today, in fact, and those drum fills are astounding. "And then there's Charlie Watts. I always liked the Stones as a kid, but as I got older I started to really appreciate him. I like the Charlie Watts right-hand-not-playing-the-hi-hat-in-two-and-four thing - that's sort of become his trademark. It's such a different feel, and it's become my bag of tricks. He's got an I-don't-care attitude that's so cool. I mean, he does care, but he just wants to play the music his way. He's a cool cat, man."